Two Palestinian men have been killed in clashes with Israeli forces in the occupied West Bank. The Israeli military said explosive devices were hurled from a car at troops guarding Jewish worshippers at Joseph's Tomb in the city of Nablus. The troops opened fire, killing two assailants, it added. In a separate incident near Ramallah, a Palestinian allegedly behind an attack that left two Israelis dead was killed in a firefight with Israeli forces. Omar Amin Abu Lila, 19, was reported to have shot towards troops, who responded by firing four anti-tank missiles at the building in which he was hiding. The Israeli military had accused him of stabbing to death a 19-year-old Israeli soldier, Staff Sgt Gal Keidan, and using his rifle to shoot dead Rabbi Ahiad Ettinger, a 47-year-old father of 12, near the Jewish settlement of Ariel on Sunday. Palestinian health officials identified the two men killed in the clashes in Nablus as 21-year-old Raid Hamdan and Zaid Nuri, who was 20. 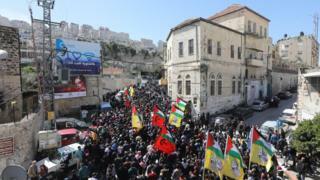 The clashes broke out as hundreds of Jewish worshippers, guarded by Israeli troops, were entering Joseph's Tomb to pray. The Israeli military said its forces had shot at two assailants who were throwing explosive devices from a car. Palestinian officials said the car was then destroyed by an Israeli army bulldozer. During the clashes, nearly 30 Palestinians were injured, one of them critically, when Israeli forces fired rubber bullets and tear gas, according to Palestinian media. Joseph's Tomb - which is revered by Jews and Muslims as the burial place of the son of the biblical patriarch Jacob - has been a source of friction in the past. It is in an area under Palestinian civilian control, but Jewish pilgrims are permitted to visit several times a year under Israeli military protection. Hanan Ashrawi, a member of the Palestine Liberation Organisation's Executive Committee, condemned the killing of the three men, and said the Israeli military had "summarily executed" them.